A Call to Quakers: Change That Name– Now! 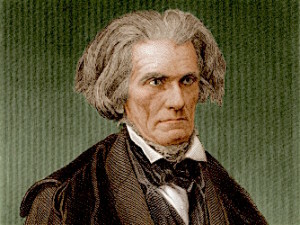 John C. Calhoun, Southern statesman, Yale man, staunch defender of slavery. The “white supremacist” Kristof is referring to is John C. Calhoun, the South Carolina politician and chief intellectual defender of American slavery. No resume-padding here– he served as a U. S. Congressman, Senator, Secretary of both War and State & Vice President, and left his mark on all of them. He would have been a southern Civil War hero too, except he died in 1850, a decade before it started; but he got the ball rolling. Yet before all that, Calhoun was an Eli, a Yale man, class of 1804. And one of the university’s “colleges,” (dorms to the rest of us) is named after him. Today, though, some Yale students are demanding that the college be renamed. It’s their version of taking down the Confederate flag. 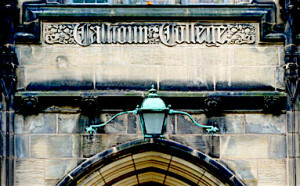 The fate of Calhoun College is up to the poohbahs in New Haven. But this idea of removing the names of slaveholders from major public spaces has spread nationwide, and as I reflected on it today, took on a distinctly Quaker flavor. If The Stars & bars is now relegated to museums & history books; if Mississippi’s state banner is being redesigned & scrubbed; if even Calhoun College has to go (tho the buildings get to stay) — then it’s time, and past time, to rename Quakerism’s greatest (or at least inarguably its largest) public monument. 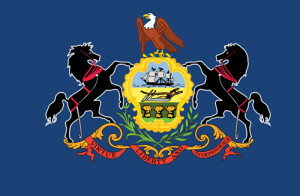 I refer, Friends, to the Commonwealth of Pennsylvania, whose founder was, of course, William Penn. BTW this is no secret, no shocking exposé. Shameless slaveholder? 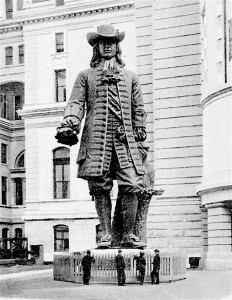 A ground view of the William Penn statue that now stands atop Philadelphia City Hall. Despite it, I readily admit to having admired Penn for much of his legacy; but this part doesn’t fit. And given the temper of the times, it will not do to make a string of excuses. So Pennsylvania has to go. But what could be its replacement? My first thought was “Woolmania,” for our sainted early antislavery crusader, the quietly dogged John Woolman. But a moment’s reflection brought me up short: a name ending in “mania” doesn’t sound quite right in this setting; and there’s the inconvenient truth that Woolman was, well, from New Jersey. Hmm. 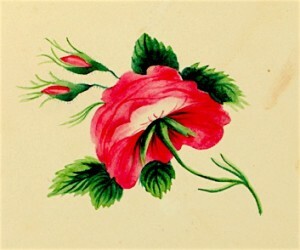 All right, what about “Benezetia,” for Anthony Benezet (1713-1784)? 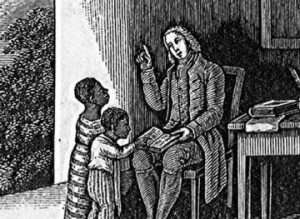 Born while Penn was still alive, Benezet became a settled Philadelphian, who published early abolitionist essays, founded the first antislavery society, helped free some, educated others, and seriously walked the talk. And “Benezetia” rolls easily off the tongue, or at least it does mine. Anthony Benezet, teaching newly free children, Philadelphia. But perhaps, despite his many achievements, thus turning to Benezet perpetuates models of white-male-as-savior which many are also trying to get beyond. Not a problem; there are others. What about Sarah Mapps Douglass (1806-1882), another distinguished Philadelphian, and a notable (and rare) black Quaker, who was consigned to a segregated back bench when she attended meeting. This would be one good way of moving her up to the facing bench. I found no image of Sarah Mapps Douglas. But it seems she was, among other things, a talented artist, who drew sketches on letters she shared privately with a circle of friends. Here’s one. Applying these concerns to [formerly] Quaker Pennsylvania might seem frivolous to some; but I haven’t yet thought up a substantive objection to it. 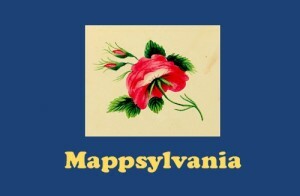 OUT With The Old–The current Pennsylvania Flag. If the names of slaveholders & oppressors should be coming off the buildings at Yale, their flags down from statehouses, and nicknames from sports teams, why should Quaker turf be exempt? So let the discussion commence. Feedback? Other names? IN With the NEW: What other state flag will bear a piece of artwork by its namesake? IS there anything by King George on the Georgia flag?? Not. “My favorite philosopher, the late Sir Isaiah Berlin, argued that there was a deep human yearning to find the One Great Truth. In fact, he said, that’s a dead end: Our fate is to struggle with a “plurality of values,” with competing truths, with trying to reconcile what may well be irreconcilable. Hmmm. “Competing truths?” Sounds like another word for “ambiguity” to me. And ambiguity is the slipperiest slope around. Once we start down it, where will it lead? Previous PostAmbushed & Sandbagged At North Carolina Yearly MeetingNext PostGeorge-Washington & His Slaves: Some Mercy For them? Any Mercy for Him? I’m grateful for this post, glad to see the growing recognition (in our culture, not talking about you personally) that slavery underlies all of our history. We’re not exempt if we’re Quakers, or live in the north. I have mixed feelings about renaming — it’s something I’ve thought about myself in a really personal way. I spent my childhood promising to change my middle name as soon as I turned 21. I was given a family surname from the south, from slaveholders. My childhood objection was that it was ugly, and I got tired of hearing “Randolph the red-nosed reindeer” from my schoolmates. By the time I was grown, I felt like I had to keep it, to engage with that part of the past — despite having what I can only describe as a deep sense of sin about that part of my family history. Changing my name felt like it would be running away. Part of what I struggle with is that my elders weren’t demons. That part of the family included some Anglican clergy, who not only had some moral principles, but educated their daughters. I am the direct beneficiary of that heritage. I was brought up in a family with generations of educated women — and I know how the tuition was paid. I can’t remake the past, and it seems counterproductive to hide it. I’d rather keep it, remember, do what I’m able to turn it to some good use. Work as I’m able for a better way forward. I am not sure that forgetfulness is the way to repentance. Letting go, yes. Erasure, no. I am very sure that there are things in my life — some that I know about and probably a good many that I don’t — that will apall people in a few generations. Have I done every thing I could do to free myself, to the best of present understanding? No. Working on it, but not there yet. “Hmmm. “Competing truths?” Sounds like another word for “ambiguity” to me. — And for some, perhaps as far back as to compassion and, dare I say it? Christianity. considering the times we are in now, August 2017, a full two years later….. I think we need to draw the line at George Washington. Confederate statues are one thing, but to go after Washington and Jefferson means that the constitution can’t be far behind with calls to re-write was originally written by former slave-holders. But with such a politically charged atmosphere, who would protect us from the saboteurs, the leftists, the progressive, the communists and bigots who would want a hand in re-writing it? At least these men, especially Jefferson were really thinking this through with the best of intentions for a future country – NOT an agenda with a subversive endgame. Yes, I believe there are people in our system that want nothing but to erase our history and a culture to rips the seams apart, and replace it with socialism and communism. Venezuela and other failed systems are clear examples –> it doesn’t work, never will work. It’s about POWER, communism and socialism is about POWER for a chosen few. correction* Yes, I believe there are people in our system that want nothing but to erase our history and our culture that rips the seams apart, and replace it with socialism and communism. Venezuela and other failed systems are clear examples –> it doesn’t work, never will work. It’s about POWER, communism and socialism is about POWER for a chosen few. Not sure who is included in the “our” of “our system” “our history” and “our culture”. Whose?